A necklace created by an artist at Maine Jewelry & Art, 100 Harlow St., uses copper from the old dome at the State House. A pendant and matching earrings made from copper removed from the old State House dome has been crafted by artists at Maine Jewelry & Art, 100 Harlow St. This bookmark, made from the copper dome at the State House, is stamped with 1910 to commemorate the year it originally was installed. Artists at Maine Jewelry and Art, 100 Harlow St., are using copper from the State House dome to create jewelry and other items. Contractors work to replace the more than 100-year-old weather-damaged and oxidized copper patina on the State House Dome with a shiny new one on July 22, 2014. BANGOR, Maine — Want a piece of the State House for yourself? Now you can have it, as the first items made by Maine artists using the copper removed last year from the State House dome are being sold at a Bangor gallery. The owners of Maine Jewelry & Art, Roxanne Munksgaard, Anne Reigstad and Amanda Coburn, unveiled recently what they are calling the Maine State House Copper Dome Collection. Much of what the artists have crafted is jewelry — tie tacks, pins, earrings, necklaces and pendants — but the collection also includes bookmarks, money clips and other accessories. Maine Jewelry & Art, which has been in downtown Bangor for five years, worked with the Bangor Public Library to do a similar project with the old copper from its dome. The store is located on Harlow Street across from the library. Over the past two years, the artists have created more than 1,500 pieces of jewelry and accessories from it. The patina from the State House dome contains more green hues than does the copper from the library dome, Munksgaard said. The copper that spent about 100 years in Bangor has more blue tones than the copper aged 105 years in Augusta. To prepare it to be used by the artists, the copper must be cleaned, then cut into smaller pieces they can work with more easily, according to Munksgaard. Before they can be used, the back of the pieces also must be sanded and sharp edges filed down. Each woman has her own style and creates different types of objects. 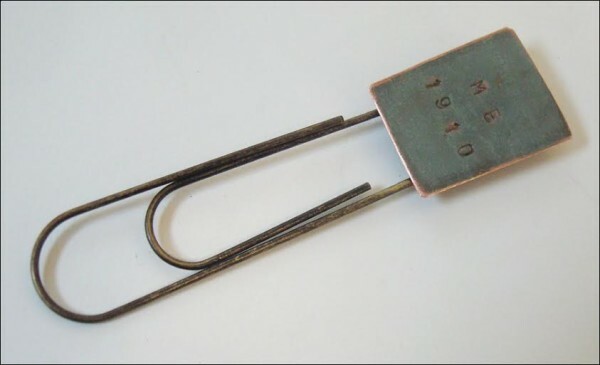 A book clip designed and made by Munksgaard used approximately a 1-inch, square piece of copper. It was stamped with “ME 1910,” to designate the year the Capitol was completed, and attached to an antiqued brass bookclip. She also designed and handcrafted a beaded necklace that has as its centerpiece an oval piece of copper about 2½ by 1½ inches in size. 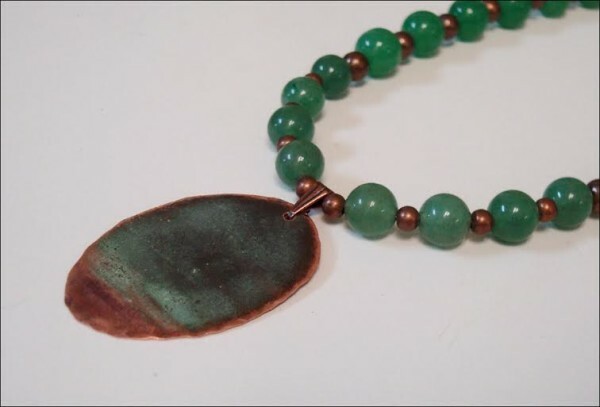 The necklace itself is strung with alternating aventurine gemstones and antiqued copper beads. Reigstad created a pendant with matching earrings sold as a set, Munksgaard said. 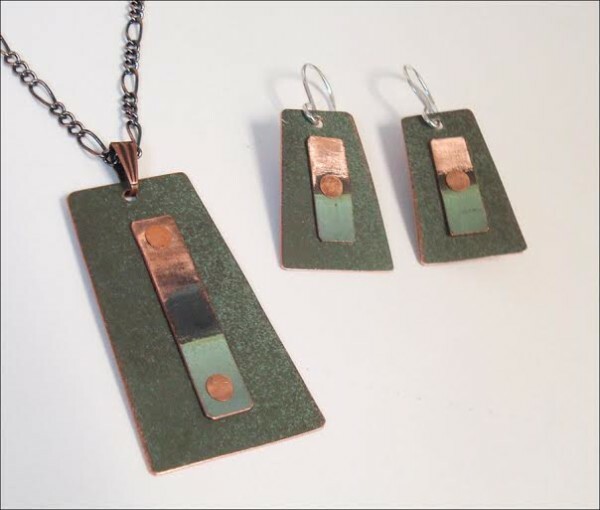 The rectangle-shaped copper pieces have a solid green patina and a variegated piece of copper riveted on top it. The variegated piece is from a different part of the roof. The cost of items made using copper from both buildings range from $20 for a tie tack to more than $100 for necklaces that include beads and other metals, such as brass. The gallery has donated nearly $30,000 to the library for its current renovation project from the sale of those items, Munksgaard said. The library gave Maine Jewelry & Art the copper in exchange for a portion of the profits. It does not have a similar deal with the state. The gallery is purchasing the copper from the State House dome for $10 per square foot, according to Grant Pennoyer, executive director of the Legislative Council, which oversees operations at the Capitol. Other artists may do the same, he said Dec. 9. 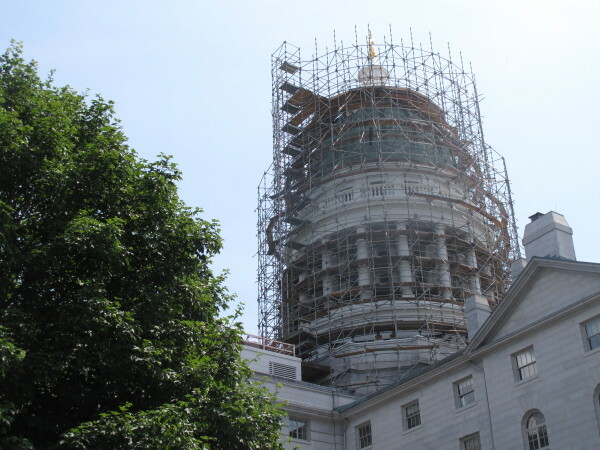 Originally, the copper from the State House dome was to be sold as scrap for an estimated $21,000, Pennoyer said. The council came up with a multipronged approach that included saving about 2,500 square feet of copper for a public arts project that is in the early planning stages, selling several to artists and art schools and creating commemorative plaques that include photos of the dome and a piece of the copper that are being sold through the council’s office. The original State House dome, which included about 7,000 square feet of copper, was installed between 1909 and 1910, according to a previously published report. It was replaced last year at a cost of about $1.4 million, according to Pennoyer.